Many individuals turn to online reviews websites, such as Yelp and Zagat, in order to evaluate the best available food options when they want to dine out. But online reviews aren’t limited to restaurants—those seeking legal assistance also have many options to choose from that allow them to compare attorneys on the Web. Since people often seek legal counsel when a private, serious matter occurs, online reviews provide an easy, confidential way to evaluate attorneys. To learn which legal reviews sites individuals are using, how they’re using them and what they’re looking for, we surveyed a random sample of adults in the U.S. We collected 385 unique responses to each of nine questions, giving us a total of 3,465 respondents. 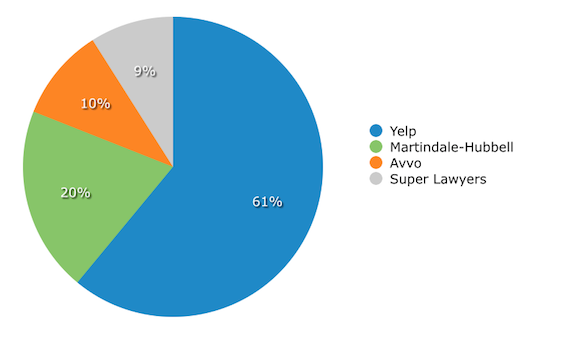 Yelp is the most popular and trusted website for legal reviews. The most important information to prospective clients is quality of service and years of legal experience. Seventy percent of prospective clients would travel further to see an attorney with better online reviews. Yelp is the most commonly used site to search for attorney reviews online—58 percent of respondents in our sample said it was the first place they turn. It’s also the website that 61 percent of users view as the most trustworthy. As such, lawyers should make sure their Yelp profile is completely filled out and updated frequently to display the most accurate information possible. When it comes to how prospective clients use these review sites, the vast majority (83 percent) said they do so as their first step to find an attorney. Only 9 percent use online reviews to evaluate an attorney they’ve already retained, while 8 percent do so to validate an attorney they’ve tentatively selected prior to scheduling a consultation. This data indicates that attorney review sites could be an effective marketing channel for your firm, helping new clients find you and determine if your practice is the best fit for their legal needs. This means it’s important to respond politely and constructively to any criticism posted on your firm’s Yelp page to resolve any potential issues and ensure you’re presenting a good first impression to clients. 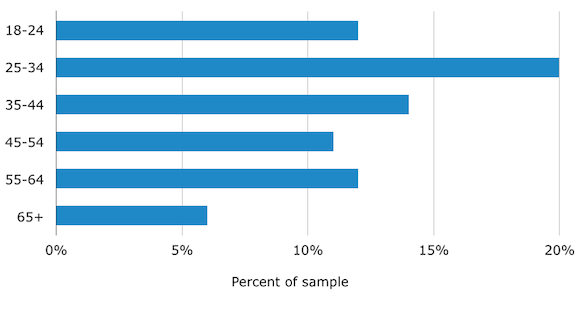 When it comes to the type of information clients investigate when visiting legal review sites, 48 percent of respondents in our sample cited the quality of service provided as most important. The overall ratings score (e.g. four out of five stars) was also important, with 38 percent of prospective clients ranking this among the most essential information they look for on reviews sites. As mentioned above, it’s also essential to constructively respond to negative comments to help keep your overall ratings high. Most sites, Yelp included, permit you to publicly respond to negative reviews. Of course, lawyers have confidentiality concerns that other businesses don’t, which can make responding appropriately more challenging. This article provides tips on how attorneys can safely address negative online reviews. When asked what the most important information about an attorney’s quality of service is, 33 percent of respondents in our sample said how well the attorney explains their legal options to them. Twenty-seven percent are curious about an attorney’s win/loss record—though that information can be misleading and hard to find. The most important demographic information prospective clients seek is the years of experience an attorney has: 48 percent of respondents cited this as the first thing they look for on reviews websites. Nineteen percent say certifications are most important, while 16 percent cite education as paramount. Age and gender are most important to 7 and 6 percent of respondents, respectively. These data points emphasize the importance of ensuring that online review sites are up-to-date with how long you’ve been practicing law and what certifications you hold. If you’re a younger or less-experienced attorney, be sure to highlight your education and certifications. On the administrative front, prospective clients are primarily turning to online review sites to locate information about how responsive an attorney is (39 percent) and how well they handle billing and payment issues (23 percent). 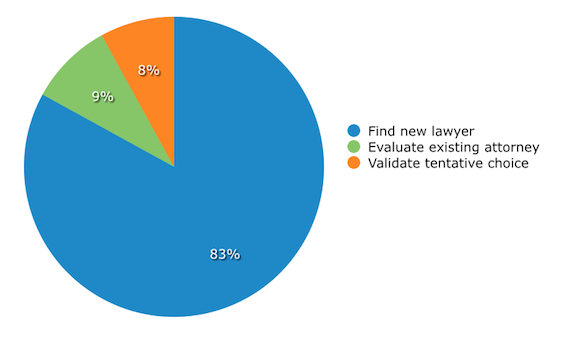 Friendliness of legal staff is most important to 16 percent of online review users in our sample, while 13 percent seek information about how easy it is to schedule appointments. Somewhat surprisingly, only 7 percent of respondents said they cared about the type of office you have—i.e. whether consultations take place in a more traditional setting with an attorney sitting behind a mahogany desk, or the attorney’s “office” is a coffee shop. These findings emphasize the importance of instituting a rapid response policy for all client communication at your firm, both current and prospective. They also suggest it may not be worth splurging on lavish office furniture as a means of impressing clients. 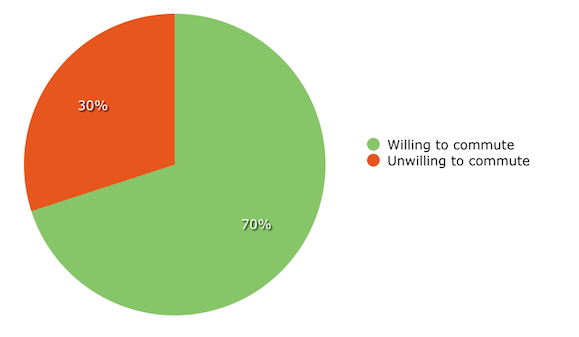 A whopping 70 percent of respondents in our sample said they would consider going to an attorney in an inconvenient part of town if he or she had better online reviews than one closer to home. This certainly speaks to the importance of positive reviews in attracting new clients. 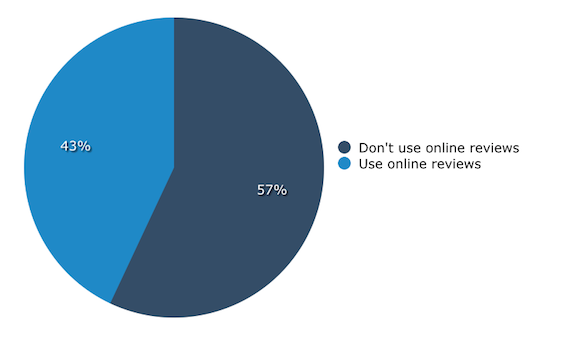 Forty-three percent of prospects say they use online reviews to research attorneys. While this is significantly less than how many consumers use online reviews to choose a restaurant, it’s higher than the percent of patients using online reviews to research doctors, and is still a significant portion of potential clients that shouldn’t be overlooked. According to The Center for Public Integrity, “Every major survey has shown that the lower the income, the less likely it is that households will subscribe to the Internet.” So it’s not surprising that the lowest income bracket in our sample was the least likely to use online reviews—probably due in part to lack of Internet access and inability to afford a private attorney. However, our research found that the likelihood of legal clients to use online reviews increased only up to an annual income of $49,000 per year—this likelihood decreased among those making $50,000 and more. This is in contrast to our (previously cited) survey of medical patients using online reviews—their likelihood of using online reviews increased steadily with income levels. One explanation for this may be that many affluent clients already have an attorney they or their family consistently use, or they might rely on their wealthy peers for attorney recommendations instead of the Web. Perhaps unsurprisingly, given the persistent lack of access to high-speed Internet among rural residents, urban and suburban prospects are much more likely to use online reviews than those in rural areas. Clients in the 25-34 age bracket are significantly more likely than other age ranges to use online reviews. This makes sense, given that this Pew Research Center study indicates individuals in this age range are the most likely to use the Internet. Having a powerful presence on legal reviews sites can help you attract new clients. An effective way to increase your online review presence is to ask current clients to leave reviews for you. Consider asking clients to leave a review after you’ve had a positive in-person consultation with them, or after their case has been favorably settled. Asking specifically for reviews from clients in the demographics most likely to use reviews sites may also be useful. For example, since you know that age is correlated with likelihood to use reviews, you might focus on garnering reviews from clients aged 25-44. You could also institute a client onboarding process that asks how they heard about your practice. Those who found you through an online review site may be more likely to leave a review given their familiarity with these resources, so be sure to ask for one. To further discuss this report or obtain access to any of the charts above, feel free to contact me at chantelle@softwareadvice.com.